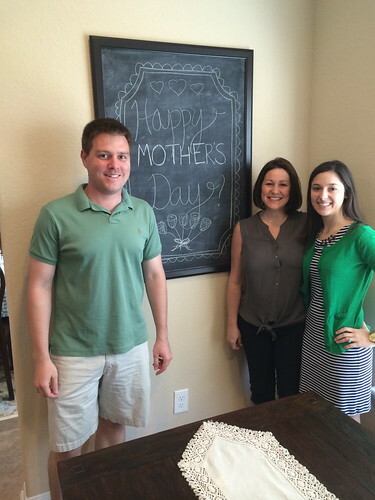 We decided to share the baby news with our parents and siblings on Mother's Day, when I was about 6 weeks pregnant. The baby will be the first grandchild on both sides, so we knew everyone would be really excited, and we just couldn't wait to share the news! 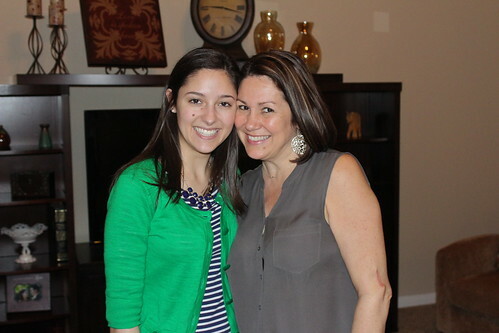 Since my sister, Kristen, lives in New York and couldn't be there in person, we told her first (over the phone). 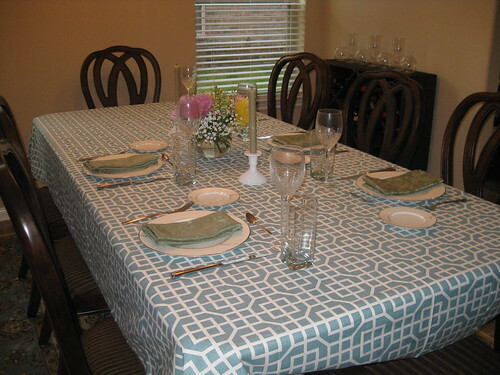 On Mother's Day, we had my parents and my other sister (Karoline) over for dinner. 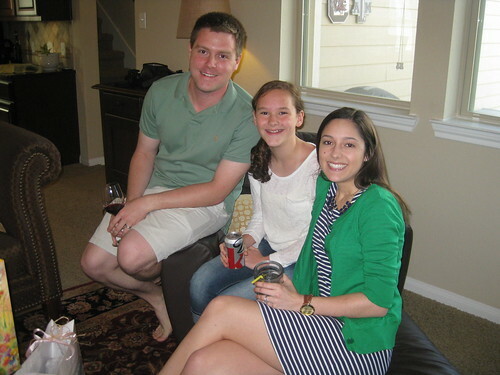 Back story: My littlest sister, Karoline, was born when I was 11 and Kristen was 9. 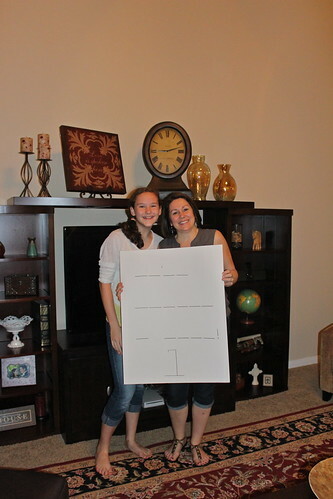 When my parents announced to Kristen and I that they were pregnant with her, they did it via a game of hangman. 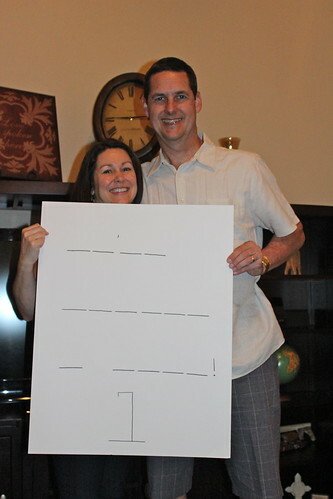 Kristen and I had to guess letters until we realized that the sentence was "We're going to have a baby!" So, when Jeff walked out and unrolled the poster, my parents immediately knew what it meant and they were so, so excited! Karoline had heard the story enough times to realize what was going on as well, so everyone "got it" really quickly and there were lots of hugs and a few tears and it was just wonderful! Excuse my "I'm suffering from all-day morning sickness" look. I promise I was happy! Haha. 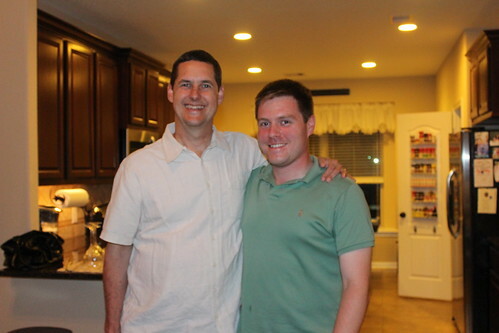 Jeff's mom is living in South Carolina right now (in their brand new beautiful lakehouse, where Jeff's dad will join her when he retires in an other year or so), and she wasn't going to be home until August, so we had to tell them over the phone as well. Jeff's dad was in South Carolina for the weekend, so when we called Jeff's mom to wish her a happy Mother's Day, we told her that we had another present for her, but that we'd have to text her a picture because we couldn't send it in the mail. Back story: Jeff's family has been going to lunch at Whataburger every Saturday for years. Even now that all the kids are out of the house, we all sometimes meet up for Saturday Whataburger lunch. 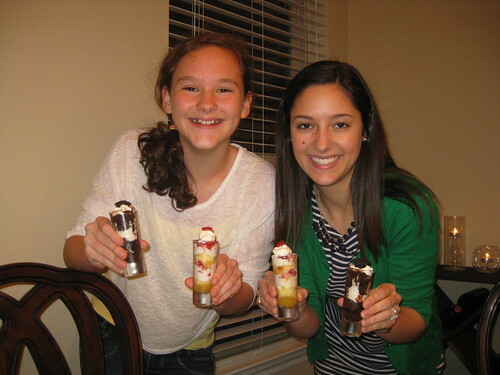 We know the manager of the Whataburger by Jeff's parents house pretty well, and Jeff's little brother even wants a Whataburger-themed groom's cake at his wedding. 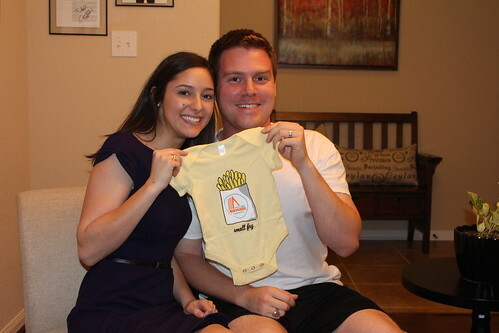 So the Whataburger "small fry" onesie was just a little nod to that tradition. Jeff's parents were really surprised, but they were excited too! 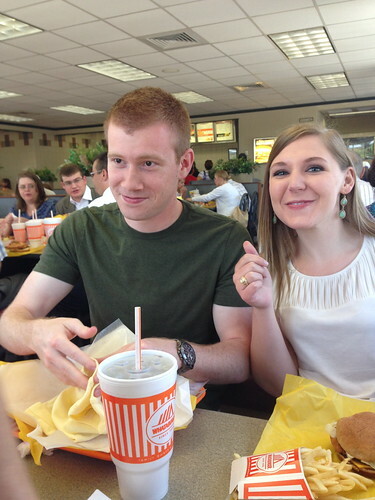 We told Jeff's brothers and our soon-to-be sister-in-law at an actual Whataburger lunch a week later (we folded the onesie up inside one of the papers that they use to wrap the burgers and gave it to Jeff's brother along with his food). Emily got it right away, but Tim was initially very confused as to why we would give him a Whataburger onesie. :) He figured it out pretty quickly though! 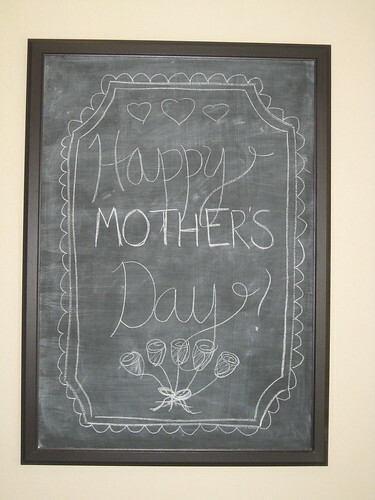 We feel so blessed to have such a wonderful family sharing in our joy and excitement. It was such fun to share the news with everyone. But it wasn't over yet... we still had to tell our grandparents and extended families! These were such cute ways to share the news! This is too cute! 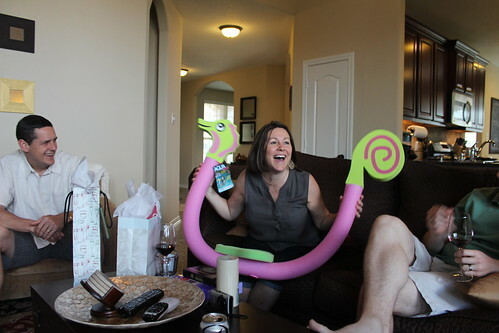 And the seahorse pool noodle is also pretty awesome. Such cute announcement stories!! 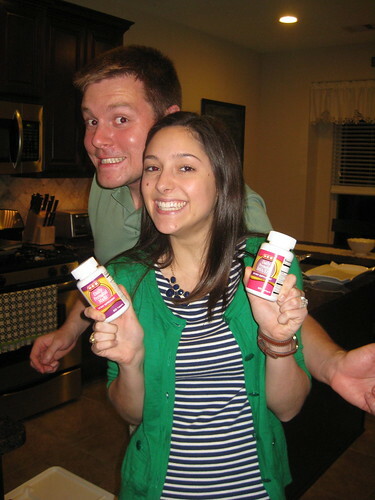 Your mom wanting a pic with the vitamins is hilarious!